Train and prepare your body at least 3 months prior to your trip, walk many mountains and variable grades. The better prepared you are the more you will enjoy the trip. Stay well hydrated as you will perspire profusely and you must maintain your fluid, salt and sugar levels from 2 days before and until the end of your trek. (Never mix your hydration powders into your water bladder as this will spoil the bladder and mould will grow.) Keep a cup in your personal bag and mix morning and night and when ever you feel dehydrated during the day. Amount of fluid intake is variable and you must know what amounts your body consumes while on the track, 4-7 litres is a guide. Do NOT use sport powders instead use hydration solutions that are used to treat sickness; these can be purchased from your local chemist. Sports drinks once dehydrated have an adverse effect on your body with incorrect ingredients and levels. Use a high quality water bladder, as the cheap bladders tend to burst or leak making it hard to gauge your fluid intake. Bladders are far supreme over bottles for ease of use and are more hygienic when use with a mouthpiece cover, prevent from touching the mouthpiece with your hands unless cleaned immediately prior. Bring two leak proof water bottles to treat your water during the day to pour into your water bladder; most water treatments take between 1-2 hours to kill the bugs. Pace your self, don’t feel to proud to stop and rest, this is a personal as well as a group journey so take your time we will not leave you behind. Manage your core body temperature and pay attention to it while trekking if you feel hot stop at every cold stream we pass and splash your face and wet your head. If you start to feel dizzy stop and tell your guide, we will then proceed to lower you core body temperature (this may require immersing your body in a stream). Heat exhaustion/stoke is an injury that doesn’t get better in a hot jungle environment the same, as a rolled ankle doesn’t recover the more you walk on it don’t let this be the reason for evacuation or to spoil your memories. Ensure you keep high hygiene standards at all times, bugs can quickly spread though a group so always ensure you clean your hands after going to the toilet, touching your feet and before any meal or snack. Clean yourself at the end of every day (wet wipes are great if you choose not to shower or bath to clean your groin and feet where skin infections can present. Anti bacterial powder is great for your feet, groin and thighs to keep your skin in good order. Keep one pair of dry socks clean for night use and powder your feet so they remain dry and warm for a comfortable nights rest. 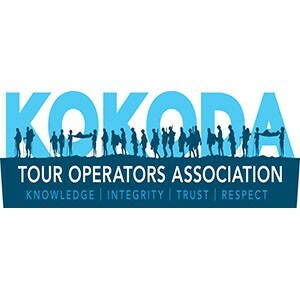 Use our gear check list to ensure you have all of the required items, tick these off as you purchase them and pack them, pre pack all of your items and weigh these prior to your trek to see what you will be carrying while in transit or on the Kokoda track. 16kgs is you domestic internal connection luggage limit, so you may need to carry on some additional luggage to fit this requirement. When purchasing equipment that requires disposable batteries ensure they are all the same size i.e. all AAA size then they will be interchangeable with each other and you can carry less spares, which will reduce weight. List all of your medications on to one piece of paper and with there uses, dosage amounts so you don’t forget if you require these when trekking. Females should consider bringing feminine hygiene products in case you require them. When your body is placed under stress it can react differently to normal. Discuss with your doctor about trailing medications that you haven’t used before to ensure you don’t have adverse reactions while trekking in remote areas. i.e. malaria tablets, Diamox etc. Use trekking poles to take the strain off you legs and to help raise your hands as they tend to swell when walking for extended periods. Carry a spare shoelace, which you tie around your toilet paper and can hang from your neck so that you can avoid placing them on the ground. You can also clip your hand sanitizer to it as well. Cut your toe nails short to prevent them hitting the end of your boot and tearing it away from your toe, this can lead to an unnecessary and painful evacuation. Cut all of your finger nails short and avoid chewing them as many bacteria can gather under them and make you sick. Train in the gear, which you intend to trek in to ensure it is all comfortable and fit for use, shoes should be well worn in to help prevent blisters.